“The internet was the tool used to coordinate the violence, in other words it was part and parcel of the accessory of tools put in place to ensure that there was maximum damage on our society and naturally when you are reacting to a conspiracy of that nature….you ensure that society is protected. But is it not interesting how when we are carrying our dead to the cemetery, at a time when we are counting losses that run into millions of dollars, someone is worried about the internet. I think the Western world has a proverbial way of putting it: ‘Worrying about or crying over the plumage of a bird and forgetting the dying bird,’ does that make sense to you? You expect us to preserve the internet and ensure that there is maximum damage to our society? What is wrong with our scale of values? I don’t think Zimbabweans are that confused. What we are looking at is a weapon of choice which was being deployed to try and coordinate violence, which has now been removed, thanks to the prompt action of the state, there is no way you expect us to sacrifice a national good for the sake of internet. If they want uninterrupted internet, let them abide by the law,” he said. 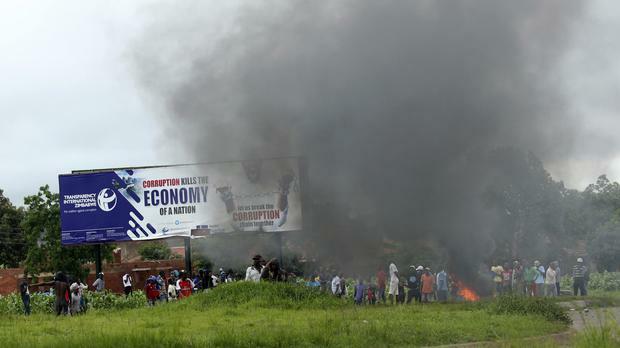 Mr Charamba added that for over one and half months and during campaigns for last July’s elections, the opposition MDC Alliance leadership was sending messages that they would want to seek action to overturn the poll results using violence. “This violence was pre-planned, pre-arranged by the MDC and its affiliates and if you could remember last month, there was a statement issued by a cabinet minister indicating that there were a number of meetings held by affiliates of the MDC and some foreigners working towards fomenting trouble in our country. People did not take that seriously and just before we left for this 4-nation tour, the President issued a statement through the relevant ministry, which also indicated that there was this preparation for violence. But above all, last year and soon after the elections, the MDC indicated that now that they had lost the elections and their constitutional court appeal, they were going to mount a series of demonstrations, whose overall goal was to try and force Zanu PF to accommodate them in the Government of National Unity (GNU), so really this is a culmination of a programme that was solely and squarely prepared and executed by the MDC, therefore which should be put on the doorstep of the MDC by way of responsibility and that is basically what is going to happen,” said Mr Charamba. “Yes there is a right to demonstrate but that right does not in any way give the licence to destroy life, property and to stop others from going to work. I find it very strange that the ZCTU, which claims to be working in the interests of the workers, stands in the way of the same workers to stop them from going to work, in other words putting in jeopardy their very prospects of employment by depressing the economy, just how do you grow a labour force against a background of such activities economic wise. If you look at the social type that was in the streets and causing all the damage, those are not employees,” he said. Over 700 hooligans have been arrested following the unrests that also affected school children.